The St. Basil's Cathedral is one of the most famous and the most beautiful cathedrals in Moscow and Russia. The cathedral is located in the city center, on the Red Square near the Kremlin. The full name of the temple is: "Cathedral of the Intercession of the Most Holy Theotokos on the Moat" or St. Basil's Cathedral. St. Basil's Cathedral was built in 1555 - 1561 years on the orders of Ivan the Terrible. The temple was built to commemorate the capture of Kazan and the victory over the Kazan Khanate. The temple has no clearly expressed facade. Cathedral looks good from many angles. St. Basil's Cathedral has repaired many times, so the current view of the cathedral is different from the original. Exterior of the Cathedral of St. Basil is not like most Russian churches. The cathedral is different, including, bright, multi-colored domes. The central dome of the temple is covered with gold leaf. The cathedral has eleven domes. View of the cathedral from the Red Square is on the picture. The height of the St. Basil's Cathedral is about 65 meters. The width and height of the temple are about 38 meters. Belfry of Pokrovsky Cathedral is located next to the main building, on the east side. The cathedral is located between Red Square and Vasilyevsky Spusk square. There is no reliable information about who built the cathedral. There are several legends, but they have no documentary evidence. There is no reliable information about how managed to keep the building during the Soviet era. Many churches were demolished in Russia then, including the "Cathedral of Christ the Savior" in Moscow. Currently, St. Basil's Cathedral is a branch of the State Historical Museum. 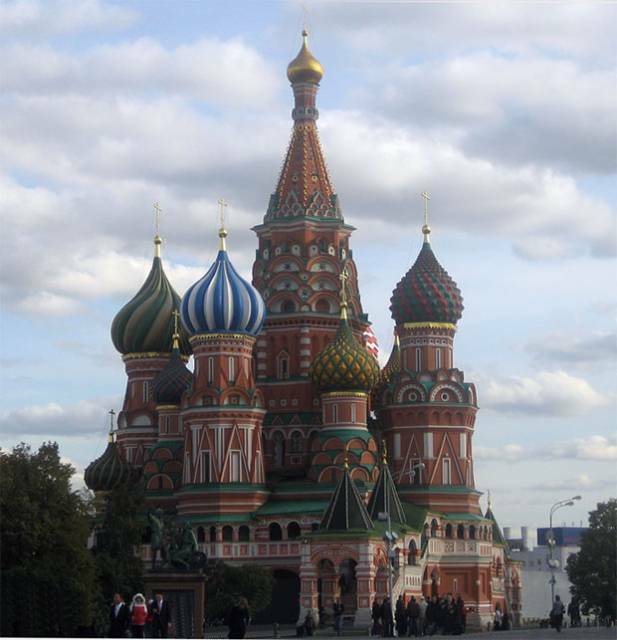 It is the world-famous landmark of Moscow, which is included in the list of UNESCO World Heritage sites. The nearest metro stations: “Okhotny Ryad”, “Ploschad Revolutsii”, “Teatralnaya”, “Kitay-gorod”. St. Basil's Cathedral location can be seen on the map of Moscow.